A sell-off in online brokerage stocks such as Charles Schwab and TD Ameritrade could be signaling trouble is ahead for the market and the economy. At the very least, they are indicating the Federal Reserve could be set to pause its interest rate increases, given the industry's sensitivity to the central bank's moves. "They are early movers when it comes to a bear market or a recession," said Richard Repetto, an analyst at Sandler O'Neill, in an interview. "E-broker stocks generally price in Fed rate changes about 18 months in advance," he added. 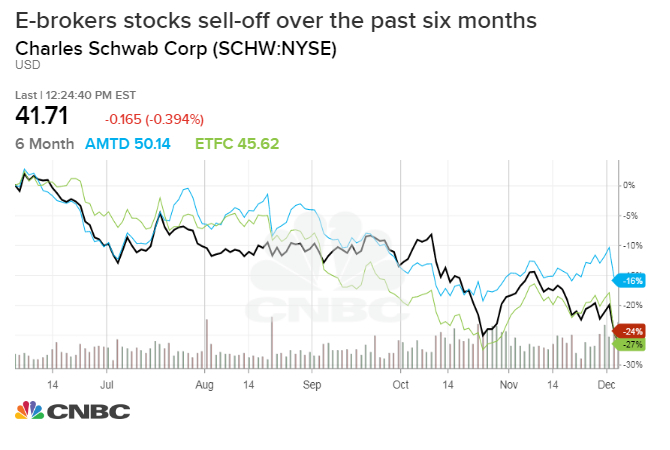 Charles Schwab shares are down 27 percent in the last six months, while TD Ameritrade and E*TRADE stocks are off by 18 percent and 31 percent respectively. Online broker stocks have dropped by 9 percent on average in December so far, compared to the 4 percent selloff in S&P 500. If their moves are any guide to the direction of of the fed funds rate, they are predicting fewer rate hikes in the coming year, according to Repetto, who showed the correlation in a research note to clients. Since the Fed would reverse course in an economic slowdown, the group could be signaling more than just a pause in rate hikes. Online brokers' stock performance responds to rate changes because brokers usually profit directly form higher interest rates. "Now all these guys have banks or bank-like structures. They earn a spread on the cash people leave on their account. When the fed funds rate goes up by 25 basis points, they only pay clients an extra 10 basis points and earn incrementally the extra 15 basis points," Repetto explained. Additionally, the margin loan rate investors pay to borrow from the brokerage also generally go up in line with the rising interest rates, he said. To be sure, although markets have slashed their expectations following the stock market turmoil over the past two months, they are still foreseeing a 78 percent chance of a hike next week and a 38 percent probability of a rate increase in 2019, according to the CME's tracker. So it's possible that sell-off in online brokerage stocks is overdone.